No-one said it would be easy (or if they did, they lied). God blessed them; and God said to them, “Be fruitful and multiply, and fill the earth, and subdue it” (Gen 1:28). Consider it all joy, my brethren, when you encounter various trials, knowing that the testing of your faith produces endurance. And let endurance have its perfect result, so that you may be mature and complete, lacking in nothing (James 1:2-4). Most of us are familiar with that scripture, but how many of us really do consider it joy when we encounter difficult situations? Yet we would probably all say we want to be mature, complete and lacking in nothing. Do we see every obstacle as an obstruction and a barrier, or as an opportunity to overcome and grow in faith? That is what will make the difference in our experience. Every battle on the pathway of our destiny is intended to create dependence on and intimacy with God. We are not supposed to overcome it alone, independent of Him, but to learn that we need Him. When we come up against something that seems impossible, if we keep looking at the obstacle it gets bigger and bigger until we end up in despair. If we look instead at God (who is God of the impossible), we get hope. Faith can arise and then nothing is impossible. Jesus said we could speak to obstacles and tell them to move, but only if we have hope and faith in our hearts. He has been there and knows what it is like to face obstacles. If we try to avoid the battles, conflicts, trials and tribulations then we are cheating ourselves of experiential intimacy, growth and transformation. That will actually hinder our development into maturity. Sadly, the kind of gospel preaching many people have responded to has completely failed to prepare them for the battles they will face. When God gives us a vision, usually we do not immediately get to see the whole of His purposes in it. Often, we only get the first step or two, like Abraham did: ‘Leave everything behind and I will show you where to go’. This encourages us to pursue Him for further revelation, and we then find that this only comes by first pursuing relationship with Him. He uses that initial encounter or vision to get us started on the pathway. Sooner or later we will meet opposition which we need to press through to overcome, often from well-meaning believers, friends or family who try to put us off doing what God is asking us to do. Other people’s negative words have hindered many from fulfilling their destiny. And you shall bruise him on the heel” (Gen 3:15). Adam lost his inheritance but God’s ultimate plan did not change. He promised restoration through conflict. There is conflict, enmity, between the path of the tree of life and the path of the tree of knowledge of good and evil. We have to be willing to fight for our destiny. Jesus himself overcame the circumstances of His illegitimate birth and an early attempt on His life. Later on, He faced temptation and opposition from all kinds of people, from his own family and disciples through to the religious and political leaders. He persevered even to sweating drops of blood in Gethsemane and willingly giving up His life on the cross. Many other people we read about in the Bible experienced the same thing. Abraham did not just get the Promised Land handed to him. God took him (and his descendants) on a journey in which they could learn to trust Him and be obedient, with varying degrees of success. When the people of Israel came out of Egypt they crossed the wilderness to the Promised Land only to find it full of giants needing to be conquered. But God gave them divine strategy to overcome the opposition they faced. So where are you? Are you in slavery in Egypt, wandering around in the wilderness, or are you in your own Promised Land, fighting to take possession of your inheritance? Joseph had wonderful visions, but his family reacted badly. He had a coat of many colours, favour, a double portion… and it seemed he had lost it all. He was betrayed by his brothers, thrown into a pit, and sold into slavery in Egypt. He suffered false accusation and imprisonment. He was forgotten and let down by other people time and again. Most people would have given up, thinking ‘those dreams must not have been from God’. Not Joseph. He continued to believe that God’s plan was alive and well. The reality is that he started out somewhat naïve, and his destiny for ruling could never have been learned in his father’s house, so God removed him. His experience of exile and prison taught him about people: through encountering animosity and jealousy he became streetwise. Instead of being deflected from our purpose by treating everything we face as misfortune, how about we call it ‘refining’, and allow it to transform and change us? David eventually became the great king he was destined to be, but not without first facing family opposition, killing a giant, surviving the previous king’s attempts to assassinate him, living in a cave with a bunch of oddballs (which sounds a lot like ‘church’ to me) and fighting off Philistines trying to rob him of his family and possessions. Only when he had overcome all that could he fulfil the purpose of God in his generation. Esther was seemingly on a fast track to nowhere. Orphaned, kidnapped to a harem, separated from her remaining family, not allowed to speak to anyone, she went through a whole year of purification in order to spend the rest of her life in futile servitude at the whim of the king. God had other ideas. As her uncle Mordecai asked her, ‘What if you have come to your royal position for such a time as this?’ God is saying the same thing to each of us today. She saved a whole nation by taking her life in her hands, stepping out of cultural expectations and going to see the king uninvited. You may not know the significance of your destiny, what its consequences might be in the plans and purposes of God for yourself, your family, your nation, your world. God has a purpose for you. Be an agent for change. Be a world-changer. (Jake Hamilton – The Anthem). It’s great to sing that we are going to change the world – but it will only happen if we believe that, because of who we are in God, we really can. This post has again been drawn from session 4. All three ‘Destiny’ teaching series are also included in our self-paced online experiential learning programme, Engaging God (see below). 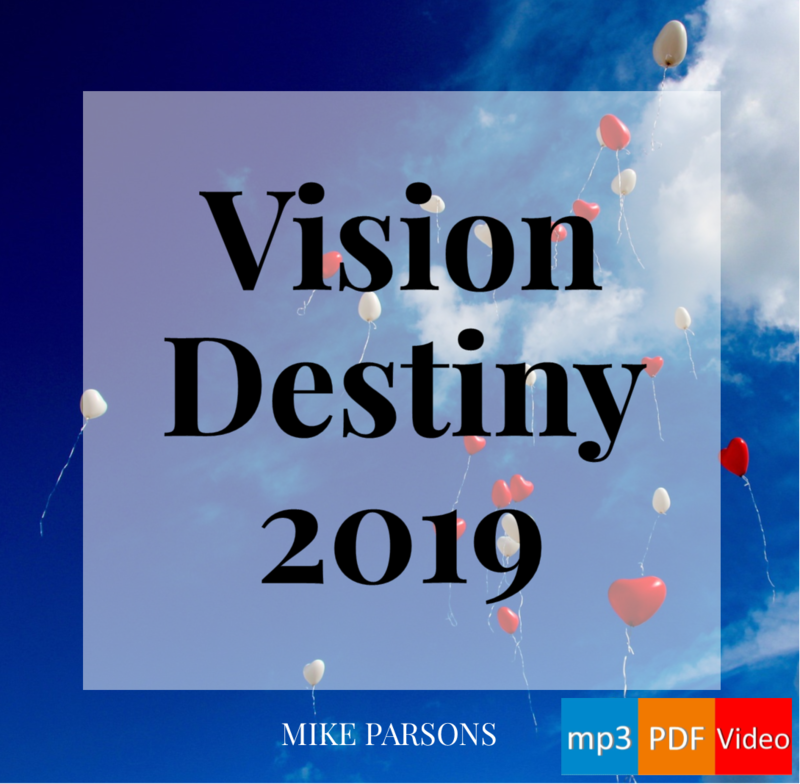 Transformation: mp3 audio teaching series and blog series by Mike Parsons (the audio series is also included in Engaging God). If our free or paid resources are a blessing to you, please consider making a donation to Freedom Trust, our associated charity, to sow into and support this ministry. Thank you!